The Department of Christian Education exists to ensure that adequate provision is made for the growing needs of religious life through worship, fellowship, study, and social action. Also included are evangelistic, missionary, and recreational activities. All persons desiring membership attend a new members’ class which covers a period of three months. 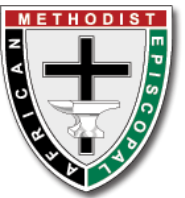 During this time participants receive instruction on the history, mission, rules and regulations, stewardship, and Articles of Religion of the African Methodist Episcopal Church. that whoever believes in Him should not perish but have everlasting life” (John 3:16).